To visitors to Lake Titicaca, a boat trip to the floating islands, a unique tourist destination, is a must. These islands are made and re-made from the totora reeds which provide home, sustenance and transportation for their residents. About a two hour boat ride from Puno, on the Peruvian side of the lake, the largest of about 40 islands and the main destination is the ialand of Santa María. See map showing location of Uros islands and Taquile island off Puno, Peru. These floating islands are the home of the Uros tribe, one which pre-dates the Incan civilization. According to their legends, they existed before the sun, when the earth was still dark and cold. They were impervious to drowining or being struck by lightning. They lost their status as super beings when they disobeyed universal order and mixed with humans, making them susceptible to contempt. They scattered, losing their identity, language, and customs. They became the Uro-Aymaras, and now speak Aymara. Because of their simple and precarious lifestyle, the Incas thought them worth little and accordingly taxed them very little. Yet the Uros, with their basic reed homes outlasted the mighty Incas with their huge stone temples and mountain-top enclaves. The totora is a cattail type rush growing native in the lake. Its dense roots support the top layer, which rots and must be replaced regularly by stacking more reeds on top of the layer beneath. The islands change in size, and more are created as the need arises. The largest island is currently Tribuna. The surface of the islands is uneven, thin, and some liken walking on it to walking on a waterbed. The unwary might not notice a thin spot and sink a leg or more into the frigid waters of the lake. 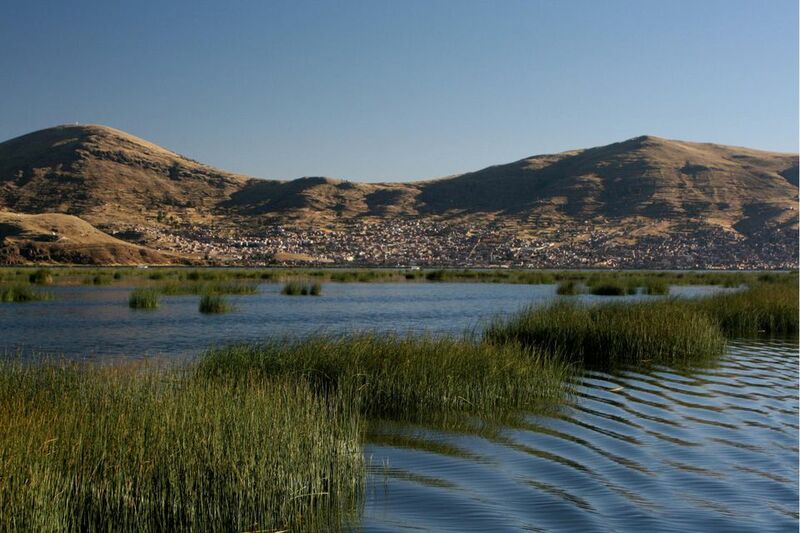 The floating islands are protected within the Bay of Puno and are home to 2000 or so Uros, who claim to have "black blood" are consequently immune to the cold. They call themselves be kot-suña, or people of the lake, and consider themselves the owners of the lake and its waters. They continue living by fishing, weaving and now, tourism. They catch fish for themselves and to sell on the mainland. They also catch shore birds and ducks for eggs and food. Occasionaly, if the level of the lake decreases, they may plant potatoes in soil created by the decaying reeds, but as a norm, they are not agricultural. The reed boats quite often have an animal face or shape on the prow and are a favorite photographic subject. The Uros residents of the islands create their homes from the reeds. The roofs are waterproof but not humidity resistant. Cooking fires are built on a layer of stones to protect the reeds. Residents wear layers of clothing, mostly woolen, to protect themselves from the cold, the wind, and the sun which at this altitude can burn fiercely. Many women still wear the distinctive derby type hat and full skirts. Scroll down for some large Pictures of Uros, Peru The Floating Islands Lake Titicaca which display scenes of daily life. The residents offer their handicrafts for sale to visitors who can expect a hard sell. Consult this list of Puno and area hotels for availability, rates, amenities, location, activities and other specific information. To visit the floating islands, check flights from your area to Lima and other locations in Peru. If you've been to the floating islands of Lake Titicaca, share your experiences, and photos, with us on the South America for Visitors Forum.